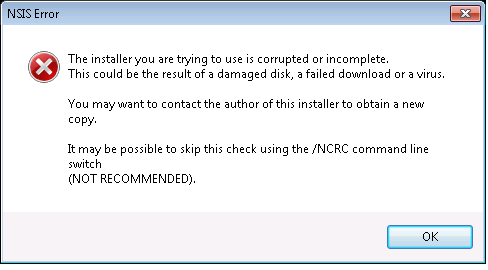 I keep getting a message from the NSIS installer that it is corrupt or incomplete (see attached screenshot). operating systems with no success. currently working TeamCity installation as the error dialog suggests for obvious reasons. Please let me know what I can do to get the latest update. Thaks a lot for your time. I cannot not see the issue with installer on our side. Do you have installed antivirus? Try to disable it or download from another machine.